There are a number of stories that suggest the genesis of glass as an expressive and utilitarian material. Some are more believable than others, but what we do know is that glass, unlike other materials was discovered in one place and spread from that locus (in the middle east near Ur or present day Iraq). Glass was an entirely new and unique material whose secrets remained with those who discovered it. It did not pop up in many places at once as did other better-known inventions or discoveries. 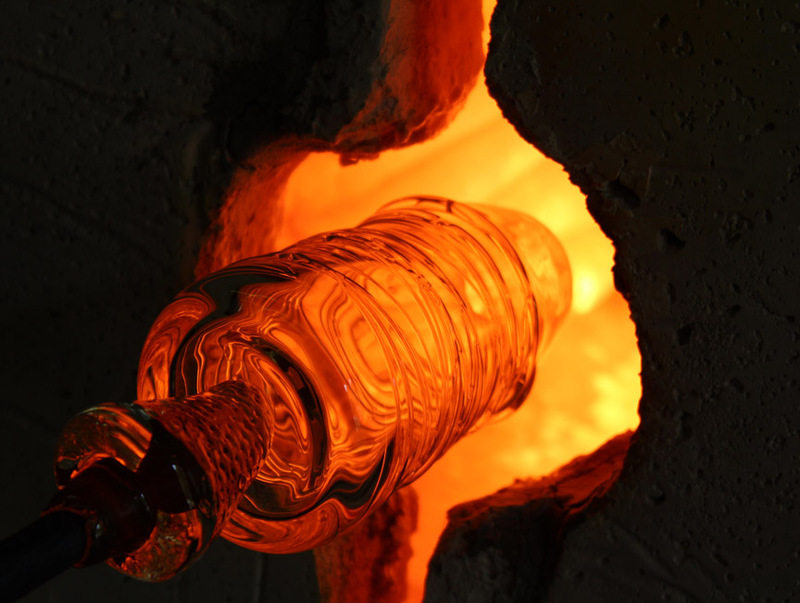 Glass was not first blown but was instead heated in small batches over fires more like a forge than anything we know today as being like a glass furnace. The feat, though was significant since the temperatures necessary to make sand turn into glass requires a pyrotechnology that rivals iron smelting, and THAT dear reader is some significant heat. Consider that with our advanced knowledge and ready liquid fuels, it still takes between 2200° to 2300°F. to induce sand to move into a glassy phase. The first objects were trails of glass wrapped around a solid core made up of sand, clay and camel dung. These were the early core formed vessels that were not blown and sported wraps of color like ribbons running down the sides of these miniature vase-like or amphora forms that were used to hold the most valuable of unguents, ointments or perfumes. Only the rich and royalty could afford these objects. They were incredibly rare and the price for a vessel would be on par with the similar prices for a nice sapphire, garnet, or emerald. The craft, science, and art of glass has been highly secretive for millennia. Its secrets were hard won and its keepers sought to keep the gems for themselves. That was about 3,500 years ago. About a hundred years before Jesus walked the earth, Romans discovered that you could dip irons in glass and blow bubbles. By coupling their knowledge of mold making in creating mass-produced ceramic items, these enterprising people turned their attention to a new way of working. Offhand glass blowing was born. During that two thousand-year period many epochs in glass creation have come and gone. The empires of glass are many, some more famed than others, and the march continues for the hope of the new. For as much as we would like to say there is nothing new under the sun in glass, artists and artisans continue to tease out new forms that have never existed before, cutting new soil and turning up fertile ground for new movements, ideas, and advancements. silver, bronze, aluminum, and iron. I have fabricated in steel, aluminum and bronze. I have carved wood, fabricated in wood, along with stone and a variety of materials all made in molds including paper, wax, polyester resin, chocolate, and clay. I have built forms from slabs of low fire and high fire clay, slip cast clay, coiled it, pit fired and raku-fired it. I have developed a slip cast clay for pit firing when I was in graduate school, and I also developed a new take on papier-mache that involved a glue that was highly reactive to heat that provided me unusual coloration. I have worked in mixed media, cloth, wood, encaustic and oil paint. I wont claim to be an expert at all of these things, but I do know that when it comes to the mainline materials used for creating three-dimensional objects, there is no other material that is like glass. Drop it on the floor and let it drizzle along like honey from a spoon and what you have moments later once it cools is a beautiful tenuous thread of liquid frozen light. Add color and it gleams like a gemstone. Exert expert control and you have a vase, a bowl, a sculpture, or a window of stained glass. No matter the methods or the means, glass is intrinsically beautiful. It gleams. Like gold, glass wont save our souls but it certainly will bring us delight. We could certainly hold our milk in ceramic jugs and life would continue perfectly fine if we didn’t have an ounce of gold upon the planet. But we seem to need the twinkle, the sparkle. Somewhere deep inside of us glass just makes us feel good. For me, it is nothing short of a miracle. For someone who has been in business since 1997, I think that is a significant statement. The truth is, in order to master glass it takes years to develop the requisite skill needed to command a material that is frustratingly difficult to manipulate. In the glass houses of Murano and earlier in Venice, a maestro was only so-called after many years of practice. Boys who were allowed to first sweep the floors would take years of service before they could rise to the level of a gaffer, the name used for the individual who blows the glass at the bench and heads a small team of workers who move together as a crew to help move at the speed of molten glass, which is most certainly fleet. I did not feel like I had begun to “get it” until two years of weekly practice. I stuck with it and I did this because the moment I saw the bubble emerge from the blow pipe. 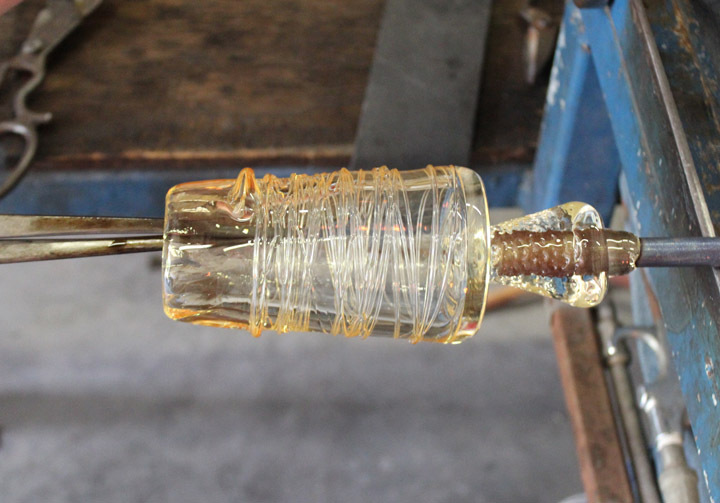 In fact, I am a little embarrassed to say that when I saw glass being blown while in graduate school for the first time, I clapped my hands like a gleeful five year old. I am a little embarrassed to say that, yes, but also proud. I am proud because this material had lit such an intense and immediate fire under me right from the start. Through all of the comings and goings in life, the hardships and uncertainties, glass has remained as the royal and regal presence it has always been in my life. My fall for glass was instantaneous. When I close my eyes I see a world of wooden buildings rising up along the canals of Murano some four hundred years ago as hot shops or glasshouses held the honor of being the glass center of the world. It wasn’t until Dale Chihuly began a school in Pilchuck Washington that the center of glass shifted to the United States in a Pacific Rim city called Seattle. Wherever the crown goes, glass remains what it has always been; so simply beautiful that we need not even speak a word or seek to describe it in order for others to “get” it. We get it. Glass eats light. Refraction is measured by an index that actually describes how much the glass impedes the FLOW of photons through its form. By slowing down light, it is accumulated, and this is what gives glass its sparkle. It seems to glow from within. And just so you know, I came by the refraction definition in a book on engineering and optics. As light gathers within the body of a piece of crystal, it shines and glimmers. It makes us feel more alive, reflecting perhaps the shimmer that is most assuredly in our own souls, that it reminds us in such simple and uncomplicated ways. For all of the tradition that has built up around such an ancient material such as glass, I will be the first to tell you that I came to glass as something of an outsider. I came to glass later in life and was not privy to the knowledge that such a tradition can amass in ones mind. The American Studio Glass Movement whcih was largely kindled by Harvey Littleton who began the first glass program in the university system in the U.S. It was at the University of Michigan at Wisconsin-Madison that Harvey developed a program that would produce some of the first glass artists who would fan out through the U.S. and begin teaching or working in studio practice to spread the gospel of glass. For as much as I feel that I stand apart, I am part of this upstart tradition, even if only marginally so. Bill Boysen was there in that program that Harvey had just set up and was in on the very beginnings of its big questions and discoveries. It was under Bill that I was able to rediscover glass for myself while at graduate school, and even though I was a full time student in sculpture, he welcomed me into the program and provided me with the opportunity to take part in a program where we made glass,sold glass, and used the money to build new equipment and to purchase supplies. His method was startlingly direct and simple; learn by doing. Let school be a lab for real life and require students to know how to build equipment and develop their own studios. For Bill, nothing resided in the theoretical realm but was discoverable right here and now. You learn by doing, and we all learned under his care. I have remained outside in order to remain fresh and to always look at glass with a fresh eye. I quickly learned that my lack of knowledge was not a deficit but an asset. I might not have been able to blow a dragon-stemmed goblet, but I was free to ask questions that many may simply have not considered due to their involvement in a tradition that was not used to asking those questions. There are great gifts that glass has yet to offer up and they reside within the potential which we have yet to realize. Lino Tagliopietra, arguably one of the greatest of glassblowers the modern world has known expresses the same sentiment; there is more to learn, more to explore, more to know even as he continues to work well into his seventies. Glass exists at the edge. 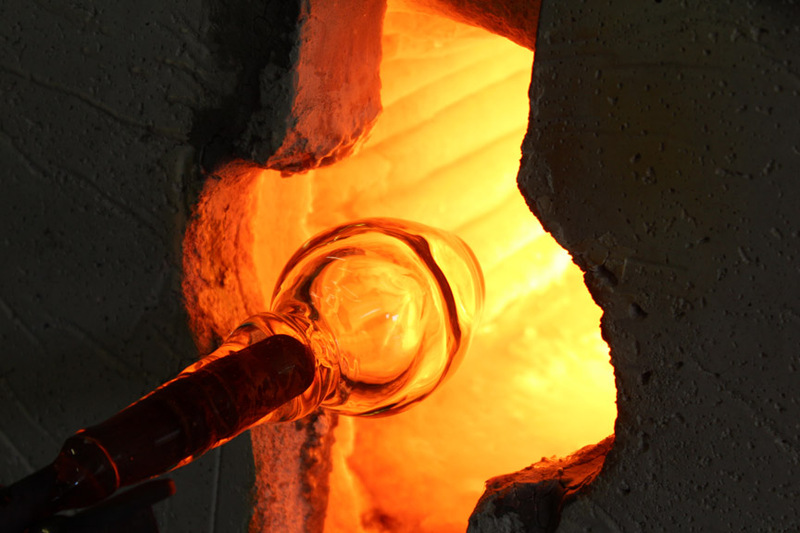 in order to work glass properly, it must be so hot that it is nearly on the verge of being uncontrollable. There is this small window of viscosity that exists where this vitreous material is worked. The ability to control this unwieldy material now in its molten state is where mastery emerges. This is not easy. Glass becomes a challenge, a mountain to surmount and along the way a great discovery of the stuff that we ourselves are made of. Whether you are the one who has glimpsed the peak of such a mountain or someone observing the fruits of such an expedition, the result is the same. We are enchanted by this impossible, even implausible material. Yet, here it is; a miracle in our midst. Glass is precious partly for how fragile it can be, but also for how difficult it can be to grasp on a technical level. If you listen, it will teach you. My greatest teacher has been the glass itself. When I first opened my studio in 1997, I began the second leg of my education in glass. I had only a few years’ worth of experience with the material. I had one course in graduate school. After that, everything was considered independent study. I was given a key to the studio for my four hour blow slot where I would blow glass and seek to tease the secrets slowly from the great body of material that were my first years in the field. I worked alone because I felt so behind everyone else who was in the glass field full-time. I was a sculptor working on earning my M.F.A. 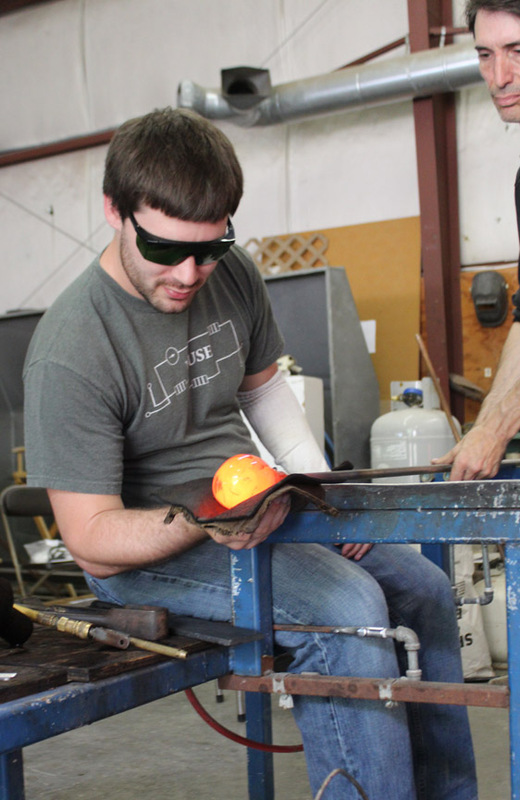 at Southern Illionois University at Carbondale and I was a late comer to the world of glass. When I left the university and decided I wanted to work glass full-time, I soon learned that the number of pieces of glass that I would make in a week would be more than I would make in an entire semester at school. Time sped up, or seemed to. The secrets of the language of glass began to emerge and carried me along from one discovery to the next. I knew nothing of the world of “paperweights” and chose to make rocks with galaxies hidden within them. The truth is, most paperweights bored me. They seemed stiff and formal. I simply was not drawn to develop any kind of study of the old traditions even though I was aware of them. I think that this is the place where new ground is revealled, even though we may not recognize it for what it was when we look on as observers to what an artist is seeking to do. Instead of making my “rocks” round, I made them bumpy. Instead of brightly colored on the outside, their shells concealed a great secret within their crystal caverns. What would be the bottom of a piece was the top of mine. Everything that was considered traditional in this form was exploded, lain aside like some old tool that had been used but was too worn to be of much service. Without any bias in my mind from the burden of too much information or knowledge, I set about quite innocently making things in a very different way. The glass, in truth, showed me the way. I learned from it. By remaining attentive, I discovered how I could take piece that took forty-five minutes to make and reduce that time down to just six minutes. I found that I could shape glass by how I moved through space instead of touching a cold wooden or metal tool to its surface, which sucked it of its life force, which for glass, is heat. By learning this, I was able to pack into the moment more operations of shaping and streamlined the process in ways I was never taught before. The only way I did this was by observing the glass. I didn’t walk fast, I merely listened to what the glass was telling me. The discoveries came in an incremental way and stacked up over time. What you see in my work is the result of a development or a route that is the result of many small steps in a larger journey. 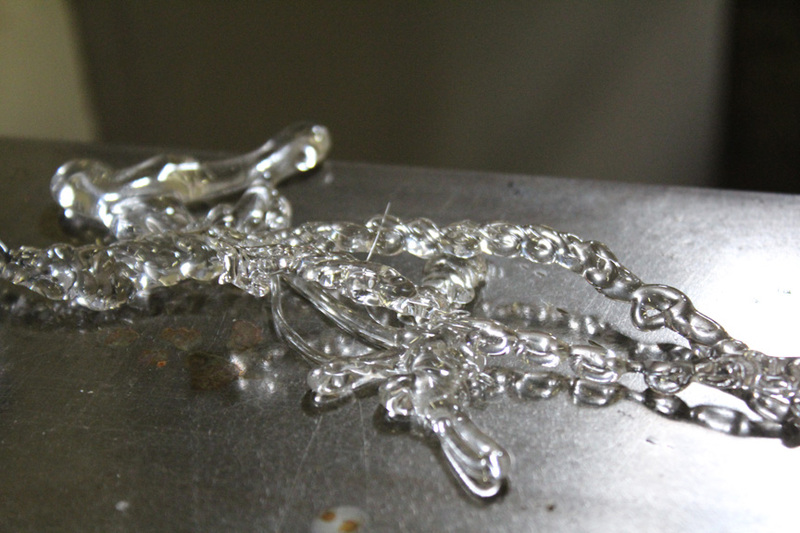 As a result of this love of glass, I teach glass making to others. I do my part to spread the gospel of glass. My own teacher, Bill Boysen, was a generous, excited, and enthusiastic supporter of his students and of the art and craft of glass making. I try to pass along a little of his own spirit in my work as well as those things I have found to be of value, too. I don’t teach because teaching brings me great economic fulfillment. The truth is, I can make more money just by blowing alone in the studio. That, however, is not enough for me. Being able to be around the hive of activity that is a studio full of newcomers to this very ancient art is something that borders on the mystical for me. There is a satisfaction that I get, a fulfillment that reflects on my early days of excitement and wonder about the potential of this material. Leaning this close to that fire is where the essence of our creative spirit resides. So I teach. I have the best of all worlds in a studio that allows me to display, create and teach all at once if need be. 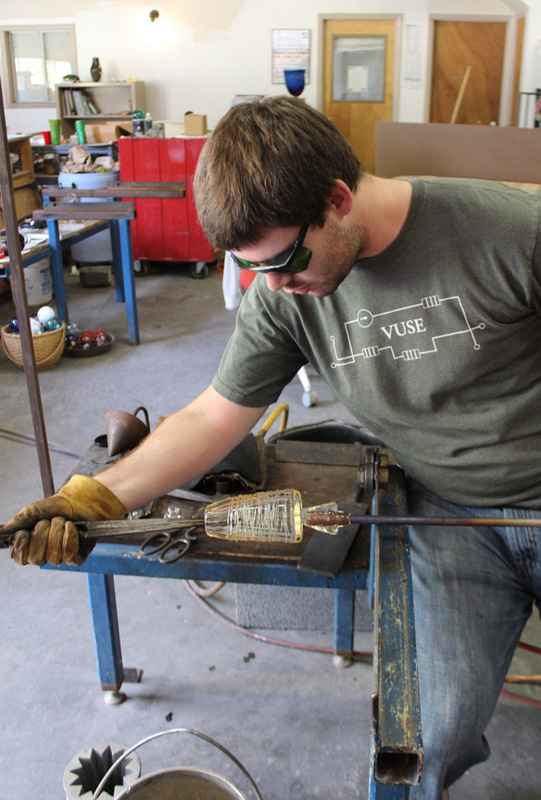 To understand the expressive potential of glass you have to just see the possibilities. There is cast glass, fused glass, torch-worked glass as well as blown glass. In my own studio I have both offhand glass blowing (glass blown by hand the old way) as well as a studio-within-the-studio with a set up with torches to teach lamp working, another term used for glass made by torch. These two realms of glass making are very different from one another and their appeal includes a broad audience. Some come to learn, while others are content to watch as I blow piece after piece. Looks are completely free. Sometimes I am host to groups who want to see the work finished in the gallery while also being able to see the work being made before their eyes. The studio is especially suited for all of this. 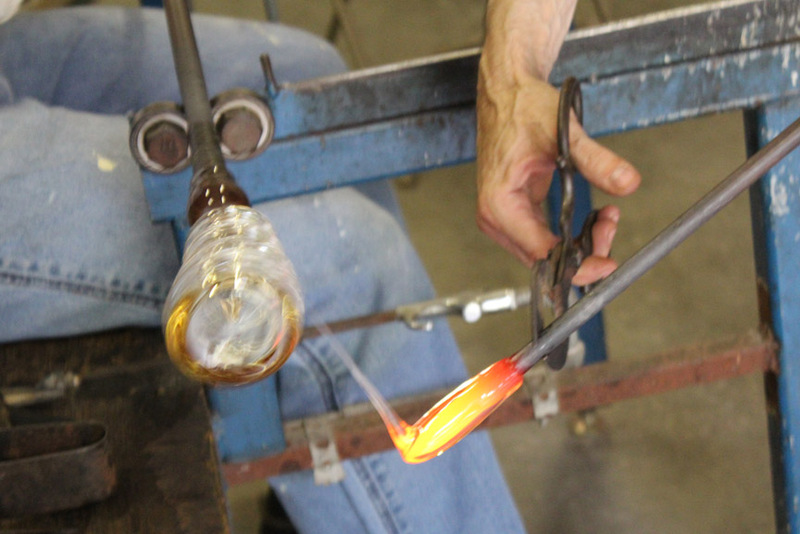 The classes offered at the studio are day-long intensives, weekends as well as short Blow Your Own Ball events (BYOB) where participants work with the gaffer in designing and then blowing an ornament or suncatcher as well as a paperweight option, as well as events that involve working with the artisan closely to create custom designs to your specifications. You are right there as the piece emerges from the pipe and as the collaborate energies flow between you and the glass worker. 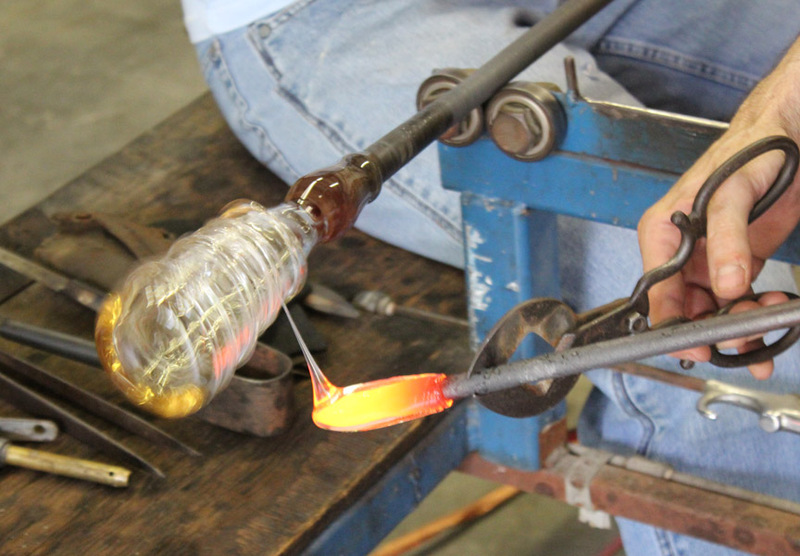 There is consideration of a glass pumpkin do-it-yourself class, bead-making classes, as well as evening catered events with music, food, and locally sourced beer and wines from our own microbreweries and award-winning vineyards. Everyone who comes leaves smiling, and it is little wonder; there is nothing else quite like glass.